Does your old unit need replaced? We offer free estimates on all unit and ductwork replacements! All Police, Military, Fire/EMS and Educators are qualified. 10% off the installed cost of a system up to $1,500. Valid through September 30, 2019. Example, if the total install is $4,000.00, the savings would be $400.00. Available on most new units with approved credit. Restrictions apply – call for details. Available on most complete HVAC units replacements. additional coverage providing you with peace of mind for the life of your manufacturer’s warranty – some restrictions apply. 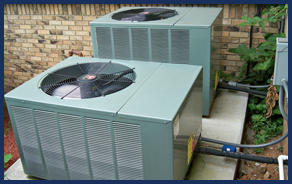 Commercial replacement units come with a standard one-year labor coverage to match the manufacturer. Financing is available through your electric company for any heat pump or dual-fuel installation. Call our office today for more details. Local Power Company. eScore provides homeowners with a simple way to make existing homes as energy-efficient as possible. Click here to learn more about the program.